As you can see in the end I decided to make a tiered skirt. The simple square skirt with elastic waist that I had first planed seemed too simple for this light fabric. I sensed the skirt wouldn’t be so great. And what’s the point of making yourself a skirt, especially in a cute fabric, if in the end you get a “meh” skirt? The gathers give some shape to the fabric, so that it looks nice. Since I had in my japanese sewing books a pattern for that kind of skirt, in approximately the length I wanted, I got lazy and just used the measures in the book to cut my fabric instead of computing everything myself. The pattern I used it taken from the book below, skirt number 16. I used the measurments for the S-M size (I’m wearing French size 36~38). – I did a real waistband for the waist instead of just folding the top of the top tier. I think it gives a more “finished” feeling, and it’s not much more complicated. Because of that I just added 1.5cm to the top for the seam. – I did a mistake when cutting my fabric, so the middle tier is slightly longer than on the pattern: maybe 2cm. The last tier might be slightly longer also since I don’t usually use 3cm for the hem. But all in all I don’t think the skirt is much longer. – the top tier was cut in one piece in the whole width of the fabric, so it’s slightly larger and has a seam only on one side. – I used french seams for all side seams. I discovered them with my teddy bear skirt and found then not that difficult and nice looking (plus they’re sturdier). – I used more elastic band that what they recommend because it didn’t feel comfy. I think I cut approximately the same size as my waist measurement. There is not much to say about the pattern, it’s very easy to make. The hardest part is gathering the different layers, because it takes quite some time. And I can’t seem to machine sew them as I’d like to. I think my stitches are too big at the beginning. But anyway it looks nice nonetheless. The skirt fits me. Maybe the fabric could be cut in bigger width to get more gathers and more puff, but it’s nice like this also. That said, I feel like I’m not totally happy with my use of this fabric. I feel like it could have been better, I’m not as crazy and proud about this skirt as I’ve been with other things I made in the past. Maybe it seems too “normal”. I’m almost wondering “Why make this kind of skirts that is easy to buy?”. Of course I know why: I can use the fabric I want, make it in the size I want, it’s a good sewing training and I wouldn’t buy it anyway ’cause I’m not supposed to buy anything. So making it myself is nice and serves a purpose. But I don’t know… there’s something missing. That said, I really needed a “basic” skirt that would be okay to wear anywhere and wouldn’t be hard to cycle with (since I go everywhere by bycicle). I guess I’ll see in the future if she grows on me. And despite what I’m saying it’s really nice for summer, I’m always wearing it since I made it. 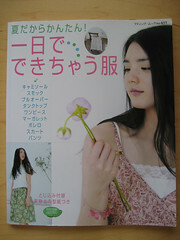 ^^; Plus my husband really likes it! I’m thinking of making a cute little white top to go with it (or several…). I’m sure it would look great, because there are some bright white motifs on the skirt. Maybe the C pattern from the Stylish Dress Book +alpha book? 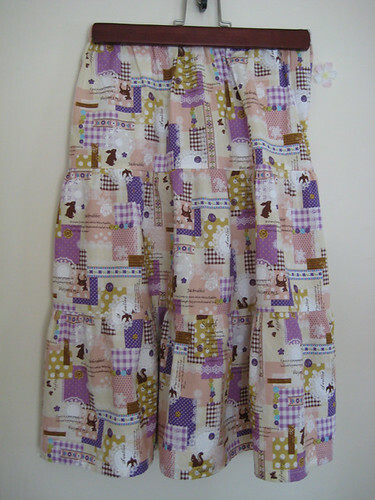 And I still have some of the same fabric I used for this skirt, I’m trying to find the perfect thing to make with it. Any suggestion?